Trade tensions now dominate the headlines. Meanwhile deeper changes in the nature of globalization have gone largely unnoticed. Globalization has now reached a turning point even though these changes were obscured by the Great Recession. The purpose of this posting is to summarize what are the seven key developments that are now taking place that describe how the global trade in goods and services are evolving from the current levels that deliver $161 trillion worth of economic value. 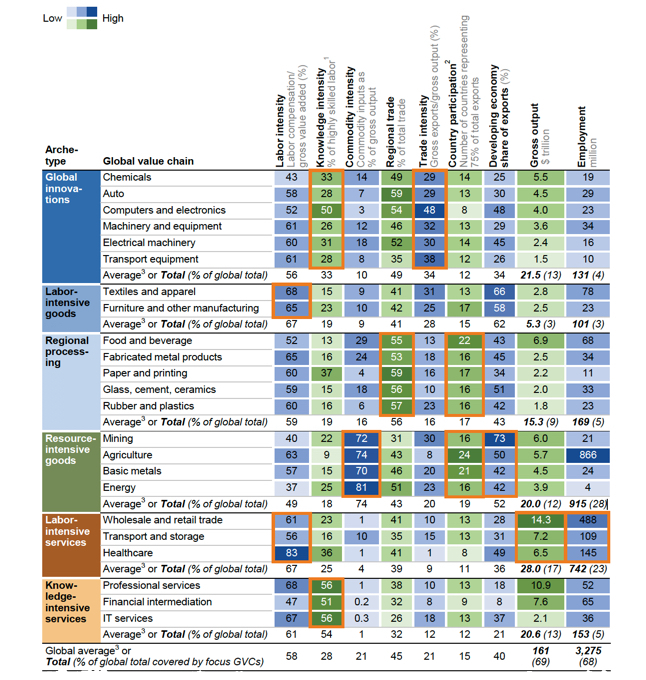 output in goods-producing value chains. becoming more knowledge-intensive and reliant on high-skill labor. Across all value chains, investment in intangible assets (such as R&D, brands, and Intellectual Property) has more than doubled as a share of revenue, from 5.5 to 13.1 percent, since 2000.
becoming more regionally concentrated, especially within Asia and Europe. Companies are increasingly establishing production in proximity to demand. of Things, and automation and AI. In some scenarios, these technologies could further dampen goods trade while boosting trade in services over the next decade. 7. These trends favor advanced economies, given their strengths in innovation and services as well as their highly skilled workforces. Developing countries with geographic proximity to large consumer markets may benefit as production moves closer to consumers; those with strengths in traded services also stand to gain. But the challenges are getting steeper for countries that missed out on the last wave of globalization. As automation reduces the importance of labor costs, the window is narrowing for low-income countries to use labor-intensive exports as a development strategy. Regional integration offers one possible solution, and digital technologies also hold possibilities for new development paths. Global Innovators (131 million people): Account for 13% of global output with only 4% of global labor. These are high income populations. Labor intensive Goods (101 million people): 3% of global output with 3% labor of labor. Regional Countries (189 million people): 9% of global output for a 5% of labor. Resource intensive Countries (915 million people): 12% of global output produced by 28% of the population. Labor intensive Services (742 million people): 17% of global output produced 23% of the population. Knowledge intensive Services (153 million people): 13% of global output produced by 5% of the population. It will be the purpose of these postings to concentrate on the roles and missions of "Global Innovators" as well as how it will supports the growth of "Knowledge Intensive Industries". It will be these sectors that will propel a rise from the current global output of $161 trillions to higher future levels through rising in productivity of other sectors.